Neurofeedback (NFB) is a non-invasive technique that helps children train their brains to function more effectively. NFB helps children to manage tasks that require concentration – like schoolwork. It is particularly successful for children who have AD(H)D and hyperactivity. Most importantly, NFB is fun and children really enjoy their training sessions. During a session a child’s brain activity is measured by sensors on their scalp and they can see their brainwaves moving on a screen. 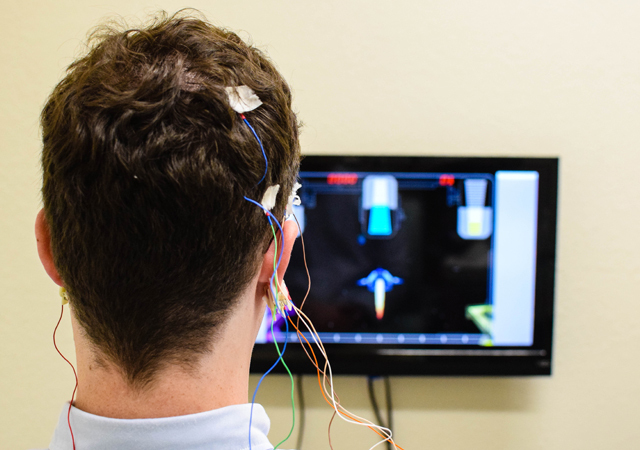 The NFB trainer analyses the brainwaves to see whether any are too high, or too low. They will then set levels for the child to achieve during the session. The aim is to enable conscious control of brainwave activity. Our mental state depends on our brainwave activity. Some frequencies assist us to be focussed and concentrated while others can make us feel nervous and panicky. Hyperactive children typically have more of the waves that cause anxiety and panic and too few waves assisting focus and concentration. NFB can help them learn how to modify these waves to promote calm and concentration. When a child manages to match the more positive brainwaves they get immediate feedback to let them know that they have done well. The feedback can be winning points in a computer game or even moving cars on a real toy race track. Karl Grimm, clinical director, studied Neurofeedback at the Neurofeedback Institute Switzerland (NIS) and with Sue Othmer of the EEG Institute and established the successful NFB training centre at Salem International, Germany for five years. He also initiated specialist holiday camps for children with ADHD in Germany which he still helps to run today. Contact us to have a chat with Karl about how NFB might be able to help your child.